The Classroom and Faculty Office Building is envisioned as a new three- or four-story building, approximately 60,000 gross square feet near the academic core of campus. The project will provide necessary classroom seats (approximately 750) and faculty offices (approximately 40) to meet existing capacity challenges and also enable the university to increase student enrollment strategically in the coming years. The academic focus of the building is “Environment and Society” and the interdisciplinary space will house faculty in the College of Arts and Sciences and the College of Design. The new building is envisioned as an interdisciplinary, collaborative learning environment drawing on the university’s long-standing expertise in sustainability and sustainable solutions. The facility will house the College of Arts and Sciences Geography Department, Environmental Studies Program, and the Center for Environmental Futures, as well as the College of Design School of Planning, Public Policy, and Management (including the Sustainable Cities Initiative). 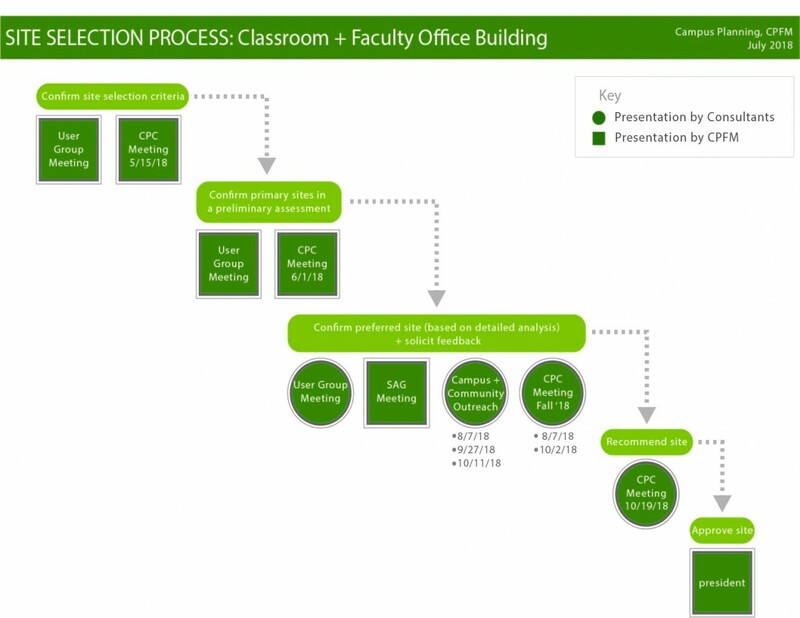 Download a pdf summary of the Classroom and Faculty Office Site Selection here. 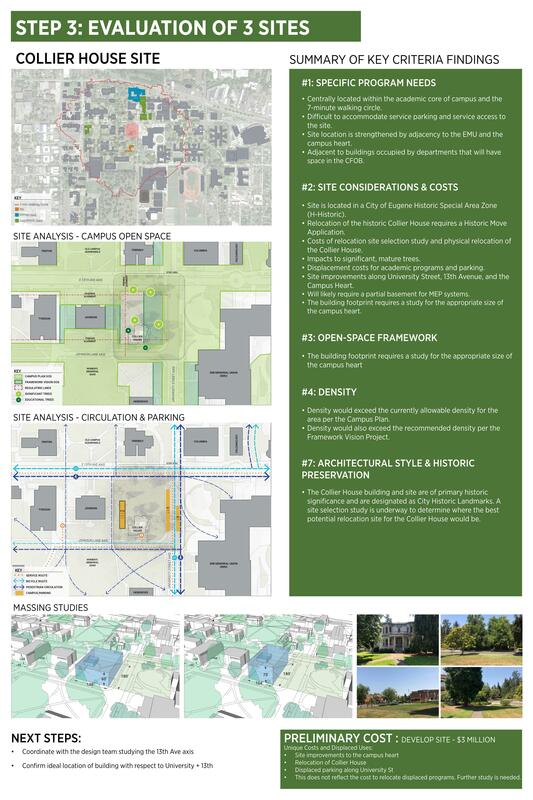 After an extensive process of consultation and collaboration (see the Process section below), the Campus Planning Committee (CPC) took action on October 19 and recommended the Collier House site as the preferred location for the Classroom and Faculty Office Building. For the Collier House, a site selection study is underway to determine the best relocation site. The web page for that project is available here. The criteria being used to analyze each of the sites for the Classroom and Faculty Office Building fall into eight major categories. These criteria are primarily drawn from principles in the Campus Plan (the document which guides development on campus). STEP 1: 9 sites to 5 The site selection process for the Classroom and Faculty Building began by casting a wide net and considering all reasonable sites available for development. 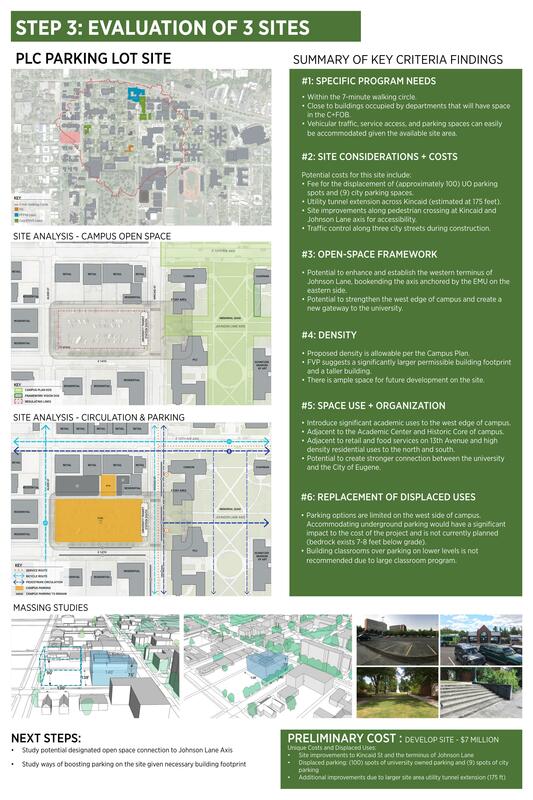 Using information generated by the Campus Physical Framework Vision Project nine permissible building sites were identified which could accommodate a building the size of the Classroom and Faculty Office Building (approximately 60,000 square feet and three- or four-stories tall). 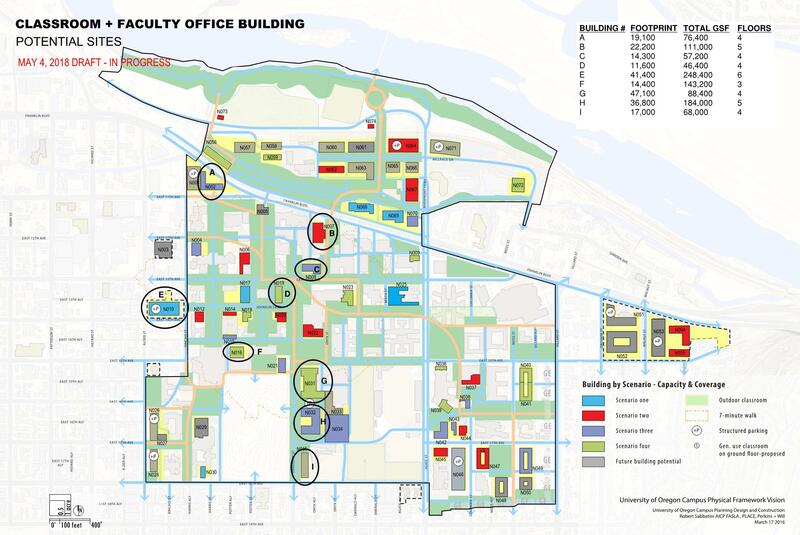 Working with the project consultants and the Campus Planning Committee (CPC), the initial round of analysis narrowed the original nine sites to five. The four sites which were removed from consideration had features associated with them which rendered them inappropriate for meeting the needs of the Classroom and Faculty Office Building program. 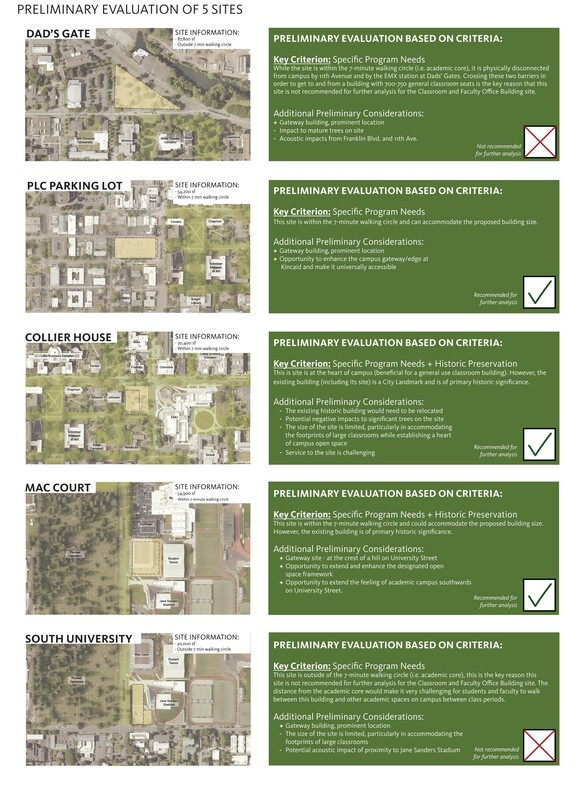 At their meeting on June 1, 2018 the Campus Planning Committee confirmed that these four sites were appropriate to remove from further consideration. The original nine sites which were identified are circled in the aerial map below. 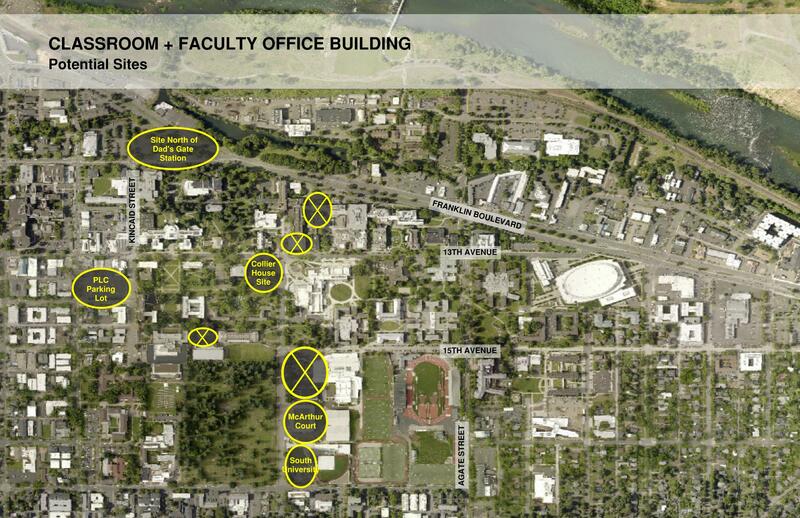 The four sites that were removed from consideration in the first round of analysis are crossed out. STEP 2: 5 sites to 3 The remaining five sites were analyzed in greater detail. 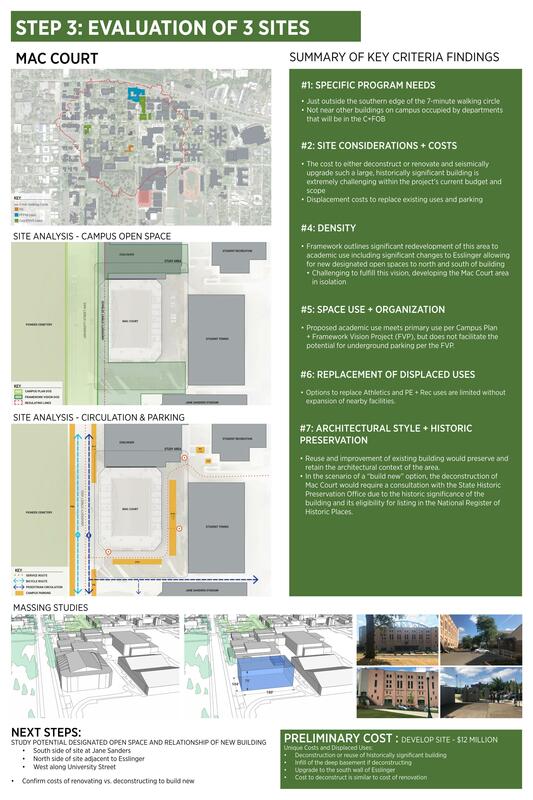 At the Campus Planning Committee meeting on August 7, the committee reviewed the analysis presented by the consultants for the project (Bora Architects and PLACE Landscape Architecture) and confirmed that two additional sites were appropriate to remove from further consideration. The two sites removed from consideration in the second step are the site north of Dads' Gates and the South University site. The primary sites under consideration are the PLC Parking Lot, the Collier House site, and MacArthur Court. This information was also shared with the campus and wider community at an open house on August 7. Download the open house boards here. The three primary sites under consideration will be analyzed in much greater detail in the coming months. STEP 3: evaluation of 3 sites Each of the three primary sites presents opportunities and challenges which are coming to light through detailed analysis. See below for information presented at the September 27 Open Houses for each of the three sites. For more information on past studies related to the PLC Parking Lot Site, additional information is available here. For more information on past/ongoing studies related to the Collier House Site, additional information is available here. For more information on past studies related to the McArthur Court Site, additional information is available here. STEP 4: Selection of Preferred Site At the CPC meeting on October 19, the consultants presented their in-depth analysis of the three primary sites: the PLC Parking Lot site, the Collier House site, and the McArthur Court site, and recommended that the preferred site for this project be the Collier House site based on their thorough analysis of the identified criteria. After reviewing and discussing the presentation by the consultants, the committee took action and made a recommendation to the President that the Collier House site be selected as the preferred site. See the full meeting record for the October 19, 2018 CPC meeting for more details. The Collier House site has since been approved by the President as the preferred site for the new Classroom and Faculty Office Building. If you would like more information or have any questions or concerns, feel free to contact Campus Planning directly (Eleni Tsivitzi, eleni@uoregon.edu, (541) 346-5024). Project updates will be primarily shared through Around the O.